Occasionally, you may need a knife for defensive purposes and the Spyderco Civilian is specifically designed for that purpose. In fact, the Civilian is one of the most respected and best-selling self-defense knives around. In this review I’ll explain why it’s so popular. Spyderco has been around since 1981, when founder Sal Glesser released the C01 Worker, Spyderco’s first folding knife. Based in Golden, Colorado, Spyderco developed the Civilian when they were approached by the DEA to develop a knife for their undercover agents. These agents could not carry firearms and often had little to no formal training in Martial Blade Combat tactics, but needed a knife that would be suitable for defending themselves when the time came. So, Spyderco gave birth to the Civilian, which featured a patented reverse “S” blade that Spyderco designed to be used like an oversized claw. If you’re looking for an EDC, this is most certainly not it. In fact, this baby even comes with a little note from Spyderco telling you that this is NOT a utility knife and will not be warrantied for utility work. We’re in serious territory here folks. The Civilian’s overall length opened is 9.188″, with a blade length of 4.125″ and a closed length of 5.188″ (a little longer than the Paramilitary 2). The serrated cutting edge of the blade is 3.75″ long, and is .125″ thick. The weight of this knife is almost 5 ounces, putting it on the heavy side but still not so heavy that it will weigh you down uncomfortably. At first glance the Spyderco Civilian can be mistaken for a Karambit but it’s a slightly different species and lacks the distinctive finger ring found on the Karambits. But make no mistake, this baby is menacing. The blade on the Spyderco Civilian is both striking and terrifying. It’s a hawkbill shape, or “S” blade as Spyderco calls it, designed for slashing with maximum effect. Note, however that the purpose of a blade like this is self-defense, not as a combat weapon designed to kill. Since the shape of the blade does not permit straight penetration it is in fact a pretty ineffective combat weapon. It is purely designed to ‘hit and run’ in a self-defense situation. That said, I know some who use it as a ‘rescue knife’ for effectively cutting seat-belts or harness straps in emergencies. Today, Spyderco manufactures the hollow-ground blade for the Civilian from Japanese-made VG-10 steel, which replaced the inferior ATS-55 steel once favored by Spyderco over a decade ago. VG-10 is a hard steel with excellent edge-retention and all-round performance. The Civilian is made with the full Spyderco serrated edge, but I have seen the knife come with a plain edge in rare cases. The serration Spyderco uses has two smaller serrations between each larger one which has proven to be very effective. Yes, it’s sharp, very sharp – but you knew that. The knife point is micro-thin, allowing it to pierce near-anything but also makes it prone to snapping if you misuse the knife (such as using it for EDC utility use). I wouldn’t necessarily call this a drawback given the knife is meant for one purpose and one purpose only: self-defense against an attacker. Note that sharpening of the Civilian blade should not need to occur often given you won’t be using it for everyday EDC tasks. When the time comes it can be done using standard tools, such as the Spyderco Sharpmaker, but you’ll need a slice of extra patience for a blade like this. The Spyderco Civilian features black G-10 handle scales, with excellent texture for keeping a grip on the knife. Because the knife is meant to be used as an extended claw, the handle and blade back does not include any of the jimping you would see on a knife designed for more utilitarian purposes. Instead, the handle on the Civilian is designed with retention and ergonomic use in mind. When you hold the Civilian in the palm of your hand and close your fingers over the handle, whether you are holding it traditional-grip or reverse grip, the knife becomes a part of your hand. It is designed for use in hand-to-hand combat, and it excels in that usage. It feels very good in your hand, and the weight of the knife does not feel at all excessive. I feel in total control of the blade. It just feels right. Interestingly, the stainless steel handle liner is used on only one of the sides rather than both. This is a pretty unique design for Spyderco, and I’m not aware of any other Spyderco knives featuring a one-sided handle liner. No real drawback here, since the one-sided handle liner works flawlessly and does not affect the usage of the knife, but it is another unique feature of an already unique knife. The Civilian features a mid-lock back design, and I found the knife locks up very well. There is no play in the knife when it is deployed, and I was unable to force the knife to bypass the locking mechanism at all. The detent to release the lock is easy to access, even one-handed, allowing the knife to be deployed and stowed with just one hand, when necessary. Note the Civilian features a ‘David Boye’ dent, common on Spyderco lock-backs that makes it far less prone to accidental closing when gripping the knife tightly. The dent is simply a semi-circular cut out in the steel of the lockbar, which was first designed by knifemaker David Boye. 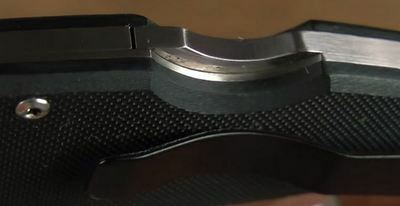 Deployment of the Civilian is accomplished by way of Spyderco’s unique “Spyderhole,” which is perfectly sized for your thumb to flick the blade open one-handed. You won’t find any spring assist here, but the blade is perfectly balanced at the pivot point so that a spring assist mechanism is not needed for quick deployment of the blade. If you prefer to have a “wave” opener, a common modification to the Civilian is the addition of a piece of cable tie to the Spyderhole, so that the cable tie catches on your clothing as you are pulling the knife from your pocket, flipping the blade open as you retrieve the knife. This might be offensive to some, adding such an inexpensive modification to an expensive knife, but it’s the best way to mod the knife if you prefer wave deployment. The Spyderco Civilian has a two-position pocket clip designed for either tip up or tip down carry, but it is not drilled for ambidextrous carry. Apparently, the DEA only issued the Civilian to right-handed agents! In all seriousness, it seems baffling that this knife is not designed for ambidextrous carry, but Spyderco has been making the Civilian since the 1990’s without modifying the basic design to allow for left-handed carry. On the plus side the pocket clip allows the knife to sit pretty deep in the pocket for maximum concealment. The Civilian is very well made and feels super sturdy as you’d expect from a knife of this caliber. You’ll find a very nice finish on the blade and handle, but I found the finish on the pocket clip is prone to easy wear and scuffing. For a knife of this price point, you would expect a reliable, durable finish from clip to Torx screw, but it seems Spyderco has skimped a little on the finish coating for the pocket clip in this case. Still, it’s not a deal-breaker. Spyderco Civilian vs Matriarch: The Spyderco Matriarch is almost like a smaller version of the Civilian. It has a similar shape but is thicker, and is intended for either self-defense or every day use. So if you want to actually use your knife in a ‘normal’ way, get the Matriarch. Otherwise, if self-defense is top priority, get the Civilian. Without doubt the Spyderco Civilian is an intimidating looking knife…but let’s face it, you’re not going to scare off any attackers with a Swiss Army Classic. This is a near-perfect defensive knife, purpose-built to rip and tear skin, muscle, sinew, and even bone. It is not designed for utility purposes, and using it for such mundane purposes can, in fact, break the tip of the blade. EDC-fans need not apply here. The finish on the pocket clip leaves a bit to be desired but aside from that I found no significant flaws. If you are looking for a purely defensive knife, the Spyderco Civilian is the best self-defense knife I’ve used to date but it comes with a hefty price tag. At almost 200 bucks this is not a stocking-stuffer…and as with most all expensive knives be on the lookout for fakes. Note if you like the look of the Civilian but a little weary of its size then Spyderco has you covered with the smaller sibling, the Matriarch. The Matriarch is very similar to the Civilian except being lighter, with FRN handle, shorter blade and about half the price too.